Not to be confused with vosotros, the second person plural familiar form for Spanish conjugations. In Spanish grammar, voseo (Spanish pronunciation: [boˈse.o]) is the use of vos as a second-person singular pronoun, including its conjugational verb forms in many dialects. In dialects that have it, it is used either instead of tú, or alongside it. Voseo is seldom taught to students of Spanish as a second language, and its precise usage varies across different regions. Nevertheless, in recent years it has become more accepted across the Spanish-speaking world as a valid part of regional dialects. Use of tú for the second-person singular (the form that is considered standard) is known as tuteo. Vos is used extensively as the second-person singular in Rioplatense Spanish (Argentina and Uruguay), Eastern Bolivia, Paraguayan Spanish, and Central American Spanish (El Salvador, Guatemala, Honduras, Nicaragua, Costa Rica, southern parts of Chiapas in Mexico). Vos had been traditionally used even in formal writing in Argentina, Costa Rica, Nicaragua, Paraguay and Uruguay. Nowadays[when?] it is very common to see billboards and other advertising media using voseo. In the dialect of Argentina, Paraguay and Uruguay (known as 'Rioplatense Spanish'), vos is also the standard form of use, even in mainstream media. Vos is present in other countries as a regionalism, for instance in the Maracucho Spanish of Zulia State, Venezuela (see Venezuelan Spanish), in the Azuero peninsula of Panama, in various departments in Colombia, and in parts of Ecuador (Sierra down to Esmeraldas). In Peru, voseo is present in some Andean regions and Cajamarca, but the younger generations have ceased to use it. It is also present in Ladino (spoken by Sephardic Jews throughout Israel, Turkey, the Balkans, Morocco, Latin America and the United States), where it replaces usted. In the United States, Salvadoran Americans are by far the largest voseo users followed by other Central Americans, Hondurans, Nicaraguans, and Costa Ricans. Voseo can also be found in the context of using verb conjugations for vos with tú as the subject pronoun (verbal voseo), as in the case of Chilean Spanish, where this form coexists with the ordinary form of voseo. It has been claimed that the countries that use voseo today have in common that they were geographically isolated during colonial times; regions with good communications with Spain at that time—today's Mexico, Cuba, Dominican Republic, and Peru—do not use voseo, or its use is confined to remote areas—this is the case in Venezuela, Colombia, Panama, and Ecuador. [by whom?] In colonial times, there was, by law, no regular boat communication between today's Argentina and Spain. We seldom make use in Spanish of the second Person Singular or Plural, but when through a great familiarity among friends, or speaking to God, or a wife and husband to themselves, or a father and mother to their children, or to servants. O Dios, sois vos mi Padre verdadéro, O God, thou art my true Father; Tú eres un buen amígo, Thou art a good friend. The standard formal way to address a person one was not on familiar terms with was to address such a person as vuestra merced ("your grace" originally abbreviated as v.m.) in the singular and vuestras mercedes in the plural. Because of the literal meaning of these forms, they were accompanied by the corresponding third-person verb forms. Other formal forms of address included vuestra excelencia ("your excellence" abbreviated as ussencia) and vuestra señoria ("your lordship/ladyship" abbreviated as ussia). Today, both vos and tú are considered to be informal pronouns, with vos being somewhat synonymous with tú in regions where both are used. This was the situation when the Spanish language was brought to the Río de la Plata area (around Buenos Aires and Montevideo) and to Chile. In time, vos lost currency in Spain but survived in a number of countries in Spanish-speaking America: Argentina, Paraguay, Bolivia (east), Uruguay, Costa Rica, Guatemala, Nicaragua, and some smaller areas; it is not found, or only found in internally remote areas (such as Chiapas) in the countries historically best connected with Spain: Mexico, Panama, Cuba, the Dominican Republic, Venezuela, Colombia, Perú, and Equatorial Guinea. Vuestra merced evolved into usted (vuestra merced > usarced > usted; in fact, "usted" is still abbreviated as either Vd or Ud). Note that the term vosotros is a combined form of vos otros (meaning literally "ye/you others"), while the term nosotros comes from nos otros ("we/us others"). In the first half of the 19th century the use of vos was as prevalent in Chile as it was in Argentina. The current limitation of the use of vos in Chile is attributed to a campaign to eradicate it by the Chilean education system. The campaign was initiated by Andrés Bello who considered the use of vos a manifestation of lack of education. The independent disjunctive pronoun ti is also replaced by vos. That is, vos is both nominative and the form to use after prepositions. Therefore, para ti "for you" becomes para vos, etc. The preposition-pronoun compound contigo "with you" becomes con vos. The direct and indirect object form te remains the same, unlike in the case of vosotros, where it becomes os. The possessive pronouns of vos also coincide with tú <tu(s), tuyo(s), tuya(s)> rather than with vosotros <vuestro(s), vuestra(s)>. All modern voseo conjugations derive from Old Spanish second person plural -ades, -edes, -ides, and -odes (as in sodes, 'you are'). The 14th and 15th centuries saw an evolution of these conjugations, with -ades originally giving -áis, -edes giving -és (or -ís), -ides giving -ís, and -odes giving -óis. Soon analogous forms -ás and -éis appeared. Hence the variety of forms the contemporary American voseo adopts, some varieties featuring a generalized monophthong (most of them), some a generalized diphthong (e.g. Venezuela), and some combining monophthongs and diphthongs, depending on the conjugation (e.g. Chile). In the most general, monophthongized, conjugation paradigm, a difference between voseo forms and respective tuteo forms is visible exclusively in the present indicative, imperative and subjunctive, and, most of the time, in the preterite. Below is a comparison table of the conjugation of several verbs for tú and for vos, and next to them the one for vosotros, the informal second person plural currently used orally only in Spain; in oratory or legal language (highly formal forms of Spanish) it is used outside of Spain. Verb forms that agree with vos are stressed on the last syllable, causing the loss of the stem diphthong in those verbs, such as poder and venir, which are stem-changing. 1 Because of the general aspiration of the letter s, it is usually not pronounced, except by highly educated people. 2 In Colombia, the rest of the country that uses vos follows the General Conjugation. General conjugation is the one that is most widely accepted and used in various countries such as Argentina, Uruguay, Paraguay, parts of Bolivia, Ecuador, and Colombia, as well as Central American countries. Some Uruguayan speakers combine the pronoun tú with the vos conjugation (for example, tú sabés). Conversely, speakers in some other places where both tú and vos are used combine vos with the tú conjugation (for example, vos sabes). This is a frequent occurrence in the Argentine province of Santiago del Estero. The verb forms employed with vos are also different in Chilean Spanish: Chileans with voseo delete the final -s from the final diphthong -áis (and -ois): (vos/tú soi /erís; vos/tú estái). In the case of the ending -ís (such as in comís, podís, vivís, erís, venís), the final -s is not totally dropped. Rather, in most cases, especially before a consonant, an aspiration similar to the 'h' sound in English is still audible. Both Chilean Spanish and Venezuelan Maracucho Spanish are notable in that they preserve the diphthongized plural verb forms in all tenses, as still used with vosotros in Spain. The same happens in the Azuero peninsula of Panama. In Ladino, the -áis, -éis, -ís, & -ois endings are pronounced /aʃ/, /eʃ/, /iʃ/, & /oʃ/. In Chile, it is much more usual to use tú + vos verb conjugation (tú sabís). The use of pronominal vos (vos sabís) is reserved for very informal situations and may even be considered vulgar in some cases. General conjugation: the final -r of the infinitive is replaced by -s, and an acute accent is added to the final vowel (i.e. the one preceding the final -s) to keep the stress. both -er and -ir are replaced by -ís, which sounds more like -íh. Venezuelan (Zulian): practically the same ending as modern Spanish vosotros, yet with the final -S being aspirated so that: -áis, -éis, -ís sound like -áih, -éih, -íh (phonetically resembling Chilean). Unlike tú, which has many irregular forms, the only voseo verbs that are conjugated irregularly in the indicative present are ser, ir and haber. However, haber is seldom used in the indicative present, since there's a strong tendency to use preterite instead of present perfect. Vos also differs in its affirmative imperative conjugation from both tú and vosotros. Specifically, the vos imperative is formed by dropping the final -r from the infinitive, but keeping the stress on the last syllable. The only verb that is irregular in this regard is ir; its vos imperative is not used, with andá *(the vos imperative of andar) being generally used instead; except for the Argentine province of Tucumán, where the imperative ite is used, though considered to be non-standard Spanish. Again, the conjugation tú has far more irregularities, whereas vos has only one irregular verb in the affirmative imperative. In Chile, the general vos conjugation is not used in the affirmative imperative. In most places where voseo is used, it is applied also in the subjunctive. In the Río de la Plata region, both the tú-conjugation and the voseo conjugation are found, the tú-form being more common. In this variety, some studies have shown a pragmatic difference between the tú-form and the vos-form, such that the vos form carries information about the speaker's belief state, and can be stigmatized. For example, in Central America the subjunctive and negative command form is no mintás and in Chile it is no mintái; however in Río de la Plata both no mientas and no mintás are found. Real Academia Española models its voseo conjugation tables with the most frequent, unstigmatized Río de la Plata usage and therefore omits the subjunctive voseo. No quiero que mintás. No quiero que mientas. No quiero que mintái. No quiero que mintáis. I don't want you to lie. No temás. No temas. No temái. No temáis. Do not fear. Que durmás bien Que duermas bien. Que durmái bien. Que durmáis bien. Sleep well. No te preocupés. No te preocupes. No te preocupís. No te preocupéis. Don't worry. 1including areas in Colombia with voseo, e.g. the Paisa Region. 'Verbal voseo' refers to the use of the verb conjugation of vos regardless of which pronoun is used. Verbal voseo with a pronoun other than vos is widespread in Chile, in which case one would use the pronoun tú and the verb conjugation of vos at the same time. E.g. : "tú venís", "tú escribís", "tú podís", "tú sabís", "tú vai", "tú estái". There are some partially rare cases of a similar sort of verbal voseo in Uruguay where one would say for example "tú podés", "tú sabés". 'Pronominal voseo' is the use of the pronoun vos regardless of verb conjugation. Voseo used on a billboard in Buenos Aires, Argentina. The sign reads, "Do you want to change? Come to Claro." In tuteo, it would have been, "¿Quieres cambiar? Ven a Claro." Voseo on a billboard in El Salvador "Order your cold one here!" "¡Pide tu fría aquí!" would have been the tuteo equivalent. Nicaragua (both pronominal and verbal voseo, the pronoun tú is seldom used). Guatemala : verbal voseo is widespread in the country. It is commonly used throughout the society, the pronoun tú, although not unheard, is extremely rare. Bolivia : in the Lowlands of Eastern Bolivia –with mestizo, Criollo and German descendants majority– (Santa Cruz, Beni, Pando, Tarija and the Lowlands of La Paz) the voseo is used universally; while in the Highlands of Western Bolivia –with indigenous peoples majority– (Highlands of La Paz, Oruro, Potosí, Chuquisaca and Cochabamba) tú is predominant but there still a strong use of the voseo, especially in verb forms. Chile : verbal voseo is spreading north- and southwards from the center, whereas the pronominal voseo is reserved only for very intimate situations or to offend someone. In addition, voseo in Chile is only used in informal situations; in every other situation, the normal tú or vos pronouns are used. Honduras : a three-tiered system is used, that indicates the degree of respect or trust: usted, tú, vos. Usted expresses distance and respect; tú corresponds to an intermediate level, expressing familiarity, but not deep trust; vos remains the pronoun of maximum familiarity and solidarity, and also lack of respect. El Salvador : a two-tiered system is used, that indicates the degree of respect or trust: usted, vos. Usted expresses distance and respect; vos corresponds to an intermediate level, expressing familiarity, but not deep trust but also the pronoun of maximum familiarity and solidarity, and also lack of respect. in the center, primarily Paisa Region (Departments of Antioquia, Risaralda, Quindío, and Caldas). Panama in the west along the border to Costa Rica—the border province of Chiriquí was once part of Costa Rica—and in the Azuero Peninsula. Mexico, widely used in the countryside of the state of Chiapas, it is becoming rare in Yucatán, Tabasco and Quintana Roo. Mainly used by not enrolled-indigenous people. Peru, in some areas in the North and the South of the country. It is widely used in Arequipa. In the following countries, the use of vos has disappeared completely or survives only very marginally in daily speech or not used at all. The traditional assumption that Chilean and River Plate voseo verb forms are derived from those corresponding to vosotros has been challenged as synchronically inadequate in a Baquero and Westphal article, on the grounds that it requires at least six different rules, including three monophthongization processes that completely lack phonological motivation. Alternatively, the article argues that the Chilean and River Plate voseo verb forms are synchronically derived from underlying representations that coincide with those corresponding to the non-honorific second person singular tú. The proposed theory requires the use of only one special rule in the case of Chilean voseo. This rule plus other rules that are independently justified in the language make it possible to synchronically derive all the Chilean and River Plate voseo verb forms in a straightforward manner. The article additionally solves the problem posed by the alternate verbal forms of Chilean voseo like the future indicative (e.g. bailaríh 'you will dance'), the present indicative forms of haber (habíh and hai 'you have'), and the present indicative of ser (soi, eríh and eréi 'you are'), without resorting to any ad hoc rules. The theoretical framework of the article is that of classic generative phonology. In some countries, the pronoun vos is used with family and friends (T-form), like tú in other varieties of Spanish, and contrasts with the respectful usted (V-form used with third person) which is used with strangers, elderly and people of higher socioeconomic status; appropriate usage varies by dialect. In Central America, vos can be used among those considered equals, while usted maintains its respectful usage. In Ladino, the pronoun usted is completely absent, so the use of vos with strangers and elders is the standard. Voseo was long considered a reprehensible practice by prescriptivist grammarians (with the idea that only Castilian Spanish was good Spanish), but it is now regarded simply as a local variant. ^ Bruquetas, Francisco (2015). Advanced Spanish. Bruquetas Publishing. p. 146. ^ degruyter.com; Ana María Díaz Collazos, Desarrollo sociolingüístico del voseo en Colombia. ^ Miranda, Stewart (1999). The Spanish Language Today. Routledge. p. 125. ISBN 0-415-14258-X. ^ Luizete Guimarães Barros. 1990. Lengua y nación en la Gramática de Bello. Anuario brasileño de estudios hispánicos. ^ a b c d e (in Spanish) Lapesa Melgar, Rafael. 1970. "Las formas verbales de segunda persona y los orígenes del voseo", in: Carlos H. Magis (ed. ), Actas del III Congreso de la Asociación Internacional de Hispanistas (México, D.F., 26-31 Aug 1968). México: Colegio de México, 519-531. ^ a b (in Spanish) García de Diego, Vicente. 1981. 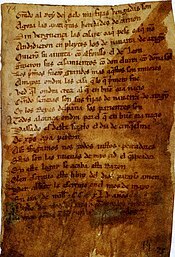 Gramática histórica española. (3rd edition; 1st edition 1951, 2nd edition 1961, 3rd edition 1970, 1st reprint 1981.) Madrid: Gredos, 227-229. ^ -ides did not produce -íes because -iés and íes were already in use as Imperfect forms, cf. García de Diego ( 1981: 228) and Lapesa (1970: 526). ^ Johnson, Mary (2016). "Epistemicity in voseo and tuteo negative commands in Argentinian Spanish". Journal of Pragmatics. 97: 37–54. doi:10.1016/j.pragma.2016.02.003. ^ Moyna, Irene and Rivera-Mills, Susana (2016). Forms of Address in Spanish across the Americas. John Benjamins. pp. 127–148. ISBN 9789027258090. ^ See for example in Real Academia Española Dictionary, mentir or preocupar, where mentís and preocupás are present, but mintás and preocupés are missing. ^ Maria Irene Moyna, Susana Rivera-Mills (2016). Forms of Address in the Spanish of the Americas. Amsterdam/Philadelphia: John Benjamins Publishing Company. pp. 243–263. ISBN 978 90 272 6700 9. ^ Solano Rojas, Yamileth (1995). "Las formas pronominales: Vos - tu - usted en Costa Rica, análisis de una muestra". Revista Pensamiento Actual. 1 (1): 42–57. ^ a b Susana V. Rivera-Mills. "Use of Voseo and Latino Identity: An Intergenerational Study of Hondurans and Salvadorans in the western region of the U.S." (PDF). Oregon State University. ^ Martha D. Ortiz. "El voseo en El Salvador". Scholarworks.sjsu.edu. ^ John M. Lipski. "El español que se habla en El Salvador y su importancia para la dialectología hispanoamericana" (PDF) (in Spanish). The Pennsylvania State University. ^ revistas.unal.edu.co: Julia M. Baquero and Germán F. Westphal (2014) "Un análisis sincrónico del voseo verbal chileno y rioplatense." Forma y Función, 27 (2), 11-40. (in Spanish) Díaz Collazos, Ana María. Desarrollo sociolingüístico del voseo en la región andina de Colombia. (in Spanish) Baquero, Julia M. and Westphal, Germán F. (2014) "Un análisis sincrónico del voseo verbal chileno y rioplatense.” Forma y Función, 27 (2), 11-40." This page was last edited on 25 March 2019, at 22:57 (UTC).